A short visit to S. M. College, Shahjahanpur, U.P., in Sept. 2010 turned out to be a longer visit and a memorable pilgrimage with the visit to Dr. Radhakrishnan Study Centre in that college, established recently with the help of U.G.C. A look at the collection of books of Dr. Radhakrishnan and on this philosopher-statesman and some pictures displayed on the Display Boards transported me to the times of the first two decades of post-independence India, my formative years at school and college. It was a pilgrimage through the golden memories of men and matters that were seriously engaged in moulding and shaping the destiny and future of India and were working really hard for laying the sure and solid foundations of her social, political and economic fabric. Also those were the times we were fired with the patriotic fervour by our highly dedicated teachers with their complete sense of belonging. Today when I look around, the academic and political scenario makes me gravely sad with all the highly-vaunted advancement and accomplishment. As a teacher, I always yearn for a return to those campus days. Alas! We used to adore and sing of the architects of national independence, their deep-rooted love of the motherland and honest respect for human freedoms, dignity and values. Most of these ennobling and self-sacrificing souls, to name a few-Mahatma Gandhi, Jawahar Lal Nehru, Gurudev Rabindranath Tagore, Lal-Bal-Pal, Sardar Patel, C. Rajgopalachari, Rajen Babu, Dr. Radhakrishnan, Mrs. Vijay Lakshmi Pandit, Lal Bahadur Shastri, Aurobindo Ghosh…..the list is long and my sincere apology to other guide-lights I couldn’t mention- left an indelible imprint on my mind and considerably shaped my mind and determined my outlook in an uncompromising manner. One of the most renowned teachers of the whole world in the 20th Century, Professor S. Radhakrishnan was a philosopher-statesman, a profound thinker, always a hungry scholar, an eloquent speaker, an innovative educationist, a great humanist with an outstanding vibrancy in his creative flow. 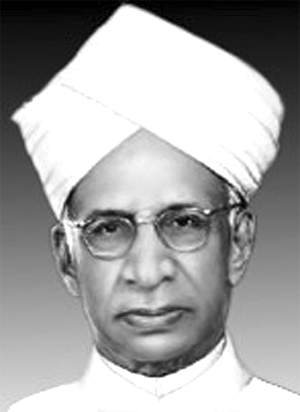 With all these precious gifts in mind, we can measure the distinction of Sir Radhakrishnan as a teacher who taught at Madras, Mysore, Kolkata, Benaras Hindu University and Oxford University and was a visiting Professor to many others and astonished his audience with his astounding memory, envious range of interests and remarkable sweep of mind. We remember Goldsmith’s line from The Deserted Village and wonder to think how such a small head could contain all this. This is what a teacher is! In brief, we may say that a teacher should be a serious scholar first and then he should perform with a complete sense of belonging to the profession and the pupil imbued and enthused with a certain amount of austerity and renunciation, deep humanity and tolerance. His breadth of vision motivates respect for the freedom and dignity of the entire creation. He was indeed the light of our culture and civilization too. Do we understand the input that is needed for such an output? Yes, a true Karmayogi who persistently pursues the path of Bhaktiyoga for Gyanyoga! We should well understand why the birthday of Dr. Radhakrishnan, 5th of September, is celebrated as Teacher's Day every year all over India. And the celebrations are lackluster and dismal and have vanished into oblivion by and large. I have been shocked beyond endurance in the past some years, the Heads of the Institutions and the faculty had to be reminded about the day which invoked a lukewarm, and even dead response. This dismal awareness of our heritage in the academics and among the academicians further reflects the sorry mess there. However, when a full lecture was delivered to the students, it roused their unusual curiosity and the impact of the personality of this teacher with a world-wide reputation on them was visible. I wonder how much can be done to raise the level of awareness in a short duration of those who are specially lectured on Personality Development! That is what we learn from the teacher in Dr. Radhakrishnan and the vision of a teacher in him. He was the enlightened soul of mankind, the conscience of education, the guidelight of society and civilization, sage-philosopher and the philosopher-statesman and an eminent man of large erudition. He was and is the spiritual ambassador of India to the entire world. He lived all his life with utmost concern for the freedom of human spirit and human dignity; and, at no stage, he compromised this dignity and freedom for material glamour and the dazzle of power. He taught that the quality of education was determined by the quality of teacher. Such teachers are a living quotation even when they are extinct physically and are remembered with reverence. Even today! These are the concerns of a teacher so serious about the glory of civilization! Professor Radhakrishnan’s candid, frank and fearless expression of views has left behind a legacy that will continue to inspire love, reverence, sympathy and understanding in the ages to come. His love of learning, his broad sympathies, his heart-felt concern for man’s misery, his vision of balanced man, his constant pursuit of truth matched by his boundless humility are an answer to the puzzle and mystery of human life. How ironical that we let such luminaries pass into oblivion so callously and, if at all they appear in the back chamber of our mind with the glow of their light, our crass materiality makes it obscure and bizarre. This is our real tragedy today. We are in the best of times and in the worst of times, we are in the most blessed of times and in the most cursed of times, we are in the times of Floods of lights and we are in times of floods of darkness; ours are the deadliest of times and ours are the pleasantest of times. Intellectual dishonesty, politics of manipulations, willfully promoting ignorance despite the free availability of rich resources, unmindful of negligence of professional growth, ever in search of cozy nooks as escape-routes, liberal and unfair use of academic authority and powers to serve our own prejudices- all to be in the social and economic swim of the razzle-dazzle of daily life- this is what ails our academia! Whatever be the conditions or environment, we can’t escape our responsibility as teachers. Today the teachers are working in an age marked by fast-track growth in every field, resulting in escalating fears, worries, anxieties and tensions; also the priorities of all, including the teachers, have changed. However, there exists a mechanism to regulate such a life. There is everywhere a stress on positive outlook meaning thereby that there is something seriously wrong somewhere in our pattern of living and working. Of all the segments of society, teaching still is significant wherein responsibilities are challenging and demanding. Once a teacher learns this and responds to the professional obligations, there would be an upward looking all around. We also observe spiritual hollowness, intellectual shallowness, personal arrogance, greed, jealousy and egotism. Emphasis in all our activity is on mundane success. The need urgently is to ask ourselves where we are lost. Coercion has taken the place of persuasion; the moral fiber of society is loosened, shaken and broken, almost at every end. The rantings of spiritual wisdom are inaudible in the deafening shouts of prosperous hee-haws. Helplessness, despondency and frustration have struck deep into the sensitive minds. It is not at all astonishing that the teacher and the vision of a teacher in Sir Radhakrishnan could see this all then. The learned, honest and unfatiguing guide of humanity issued forewarnings also on this count. And they have gone unheeded all along! Before any devastating disaster overpowers humanity because of us, the teachers, and history records it as an unpardonable wrong, let us wake up to our onerous task, happily chosen or fallen upon us by chance. This determines the role of the teacher in the present situation. Never before, not even in the time of Dr. Radhakrishnan who had been a witness to the disastrous consequences of the Two World Wars due to which partial stupor is still there, have the challenges and responsibilities of a teacher been so tremendous. In the end, I hope that the teachers working in the schools, colleges and universities will define to themselves what it is to be a teacher and what essential regular inputs can make their performance meaningful, purposeful and laudable. This is a high time for self-introspection. It may be noted that ever-freshening zest for learning, unobstructed pursuit of truth, sense of mission, capacity for taking pains in disseminating light and knowledge, standing like a rock in the face of human degradation are some of the essential traits of a true teacher. Such a teacher shall produce men and women of immense moral and intellectual prowess and strength of character to guide and shape the radiant flow of humanity. It is earnestly hoped that the inspiring and elevating influences of luminaries like Professor Radhakrishnan will help us, the teachers, in remedying the situation as a double blessing! 6) Radhakrishnan, S: Recovery of Faith; Hind Pocket Books, Delhi, Ed. Aug.1967. There is no parallel example to refer with The greatest teacher of India Prof. Sir. Dr. S. Radhakrishnan. I know this fact when I was a student of Sanskrit, which now after reading this golden essay I have realized the shallowness of my knowledge about this proud son of Bharath Sir Dr. S.R. There are no words in me to express fully the feelings about this BHARAT RATNA. I bow myself before him. what a great philosophy of education by Radhakrishnan ji. Though I use to try a lot to be a teacher like the same but I am still very unsatisfied with my performance. I really don't know when I will achieve satisfaction with my profession !! The above mentioned explanation is quite unique and wonderful. It provides every base to the study. the study is in fact is beautiful and meaningful. It Portraits a best Teacher with dedication, sincerity. hard work and zeal of learning !! A Best Teacher is a friend philosopher who can guide a student's life. That is why a teacher is known as a 'Nation Builder'. IN THE WHOLE WORLD FOR INDEFINITE PERIOD !! A beautiful synopsis of what it means to be a teacher. It highlights the need for teachers to demonstrate commitment,love, humility, passion for learning, adaptability and the most invaluable quality of being able to inspire their students to be the very best that they can be.I am honoured to be a teacher! The article is a reminder of celebrating teacher's day with thoughtful purpose. Dr Radhakrishnan was a man of many parts and his contribution and commitment to the cause of education is well understood. The decline in realizing the importance of a teacher by the society (includes teachers themselves, as well) is a foregone conclusion. Also, on the part of teacher, we need to assess as to how many of us could arouse the interest and motivate the students to become good human being with all ethical values within.during earlier days, by and large, most of the students went to their schools/colleges/universities to learn with humility and then get a degree. Now a days, the scene is changed and majority of the students intend to get the degrees without earning it.the celebration of teacher's day is a reminder as how to develop the present day society through constructive role by both the players viz.,the teachers and the students. Earlier, a teacher used to command respect and now perhaps he/she demands the same from his/her students. The level that the teacher himself reaches bears an indelible mark on his teaching- when you teach from the inside, everything changes. In this era, there is a tremendous gap between real teachers and the taught. Paradoxically, that causes a tremendous momentum forward for those who yearn for learning. Dr. Radhakrishnan's books on spirituality are a direct product of that gap. Very true sir.... Today also when we look at the situations at the academic institutes, we have to feel sorry about it. The term DEVOTION which is the base for any good teacher is hard to find these days at places where we r studying. Take the example of engineering and other technical institutes.... Technology is fun if taught by relating to simple real life scenarios.... But again it needs a truly devoted and enlightened teacher to do the same. On my personal level, am trying too to be a good scholar first ...to be an ideal teacher one day. People like u are really supportive... Never thought of getting such a master... No regrets even if it was just for a season... But will remember u sir for my whole lifetime.